I am an alternative therapist, a healer, a teacher. A Reiki Master and a Crystals Master. Tell us how you chose or were chosen for your line of work? What experiences led you here to where you are today? I was a working professional. Banking and Shipping. Reiki was an accident. Somebody mentioned the word Reiki and I decided to take a look...there was no looking back. had amazing success in healing people and I decided to become a Master. It was not easy for it meant big time expenditure. Fees for Mastership courses are not cheap and I wanted to go back to the same school in India so it also meant buying air tickets. But my heart said it was an investment I had to make, not knowing that two years later I would lose my 9 to 6 job and that this would become my full time profession. There were depressions, frustrations along the way, but there was always a smile on the face. Recognition came. I always had the desire to travel, to spread the word of Reiki and that happened. My first book was published in 2010 and another is in the pipeline. How has your work evolved and where is it headed? I have done well for myself. Recognition has been almost spontaneous. While sticking to the basics of Reiki healing, I branched out into Crystal Healing and acquired Mastership. Travel started happening, which I always wanted and I am now in several countries every year spreading the word of what I do. Having done a bit of research on the subject of Reiki Symbols, I published my first book "Reiki Symbols - A Revelation". As I mentioned earlier, another book, "Reiki - Physical Healing & Beyond" is in the pipeline. I intend to reach out to as many people as I could in the years to come. What are the latest trends, advances and developments in your brand of spirituality? Different versions of Reiki have sprung up over the years. Karuna Reiki, Tummo Reiki, Angelic Reiki, etc. Most of these are offshoots of the original version. What are Singaporeans' biggest blocks in embracing your type of spirituality? Faith(lack of it) and religion often plays a big part in not allowing people to accept this kind of spirituality, and this applies to all the people of the world including Singaporeans. Spiritual awareness in Singapore is there, however, there is a big fluctuation in the energy levels, which I believe is because of the big number of floating population in the city. Tell us about your understanding of the background of the reiki scene, how long it has been around and where it is headed in the near future? Reiki, in its present form, was rediscovered by Usui Sensei in 1921/22. Alternative therapies have been in existence for hundreds and thousands of years. Every civilization and culture had it, but was not available to the common man. Usui Sensei received his enlightenment in around 1921 and started his Reiki clinic in 1922. Several other branches of Reiki have come up since then. Reiki is a science that will always be in high demand. With today's stressful life, more and more people are seeking alternatives to the traditional methods of healing. How big is Singapore's demand for your services? What changes have you seen over the years in this business in terms of receptivity, enthusiasm and interest in your work? Demand in Singapore is fairly adequate. Competition has grown over the years but healthy. 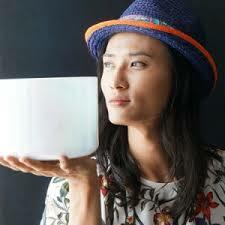 The spiritual scene in Singapore has waxed and waned which I believe is due to the large number of floating population. You go on reiki pilgrimages. What have you learnt on your travels and retreats abroad? My pilgrimage has been to Japan. The memorial stone on Usui Sensei's grave holds an inscription in ancient Kanji language which speaks about Usui Sensei's story. I recently had it translated into English so as to be able to shae with all those who are interested. I have also visited Mt. Kurama in japan where Usui Sensei received his enlightenment. I have had some wonderful experiences there. The calling to return has been always strong and hope to do so soonest possible. In recent years, you've also enjoyed success at international fairs. What are the differences between the UK, US and other Asian scenes and the Singapore scene? The fairs overseas are huge and each with its own flavour. While London does it at places like Olympia or Earls Court which are exhibition halls, the one in Los Angeles is done in the ball room of Hilton Hotel. While the booths in London are typical while boards, the booths in Los Angeles are silk drapes and with chandelier lighting. In Christchurch, NZ, it is a family run show and the walls of the booths are made of corrugated cardboards. The common point they all enjoy is the paid workshops that they do. These are not found in Singapore. Singapore fairs are much smaller, both in terms of number of vendors and booth size. Ever since Be Magazine closed down in 2002, there has been a big vaccum. A few players have come along since then but much more needs to be done. What do you think needs to be done to increase the holism market in Singapore? We need bigger and better holistic fairs, twice a year. It would also pay to bring these fairs to the heartlands, to the atriums of the malls, to create more awareness. What do you see your role as a member in the holism community? What is your biggest wish for your work in the near future? To be the personal healer of a King or a President...ha ha (joking). Looking forward to my next book. How do you hope Singapore will evolve spiritually? It already has come a big way and I am sure it will grow stronger. I am a visionary, inspirational leader, singer and explorer of Sound and Consciousness. My work is to inspire and spread the message of love and harmony through music and the power of sound; creating platforms for people to step into their powers by expressing their inner voice. I also specialises in coaching on how to utilise the Principles of Universe to manifest what you want and how to shift where you are to where you want to go. I have been in this field teaching for more than 10 years now. Tell us how you chose or were chosen for your line of work and the difficulties and challenges you have faced along the way? Since I was little, I was extremely curious about why i am here on earth because I had a strong sense of knowing that I do not originate from this planet. Having observed the people around me, heard stories and received education from schools over the years, it had placed a strong imprint upon my awareness questioning myself, "Will I have problems when I grow up like the adults around me?" "Why do people fall ill and why are there death? And when people die, why do they feel so sad?". It came to me clearly when i was teenager that when I am in my thirties, i shall retire from personal problems and begin to enjoy my life emotionally free. And this conviction propelled me to explore the mysteries of life and understanding of the Universe. The first difficulty faced in this business is about believing and trusting your work that it has a positive impact, influence and result to the people you serve. And while supporting others by providing a space for them to step into their own powers, it certainly is a journey for myself to keep refining what I do and to support myself with a consistent, discipline yet flexible learning practice. The second difficulty encountered was the approval and acceptance from my mother. It took her sometime before understanding that what I was dealing with was not cult related. I believe that the nature of my work is to refine my mind, heart and mind and in the process should improve my lifestyle in all aspects. The first immediate impact and positive return will manifest within the family and thus it had gained the trust and respect from my family members. The third difficulty is to trust that the Universe will provide all the physical resources you need even if you have only 3 participants in one meditation sitting. With constant personal training, meditation and the willingness to improve, upgrade and let go of the old, without needing to fit myself into what the society wants me to, success came within merely 6 months and everything steadily and firmly grew within the next 2 years with me teaching abroad a country after another with frequent long-term rewarding invitations. I started from hosting meditations to concurrently providing private consultations, and it grew to having healing workshops to weekly seminars. The content of my work revolves around developing the power of the mind through meditation but also strongly focuses on the power of sound. It has gone from toning to speaking "The Light Language", to singing and now using Alchemy Crystal Singing Bowls and other acoustic healing instruments. I had gone from single weekly sessions to a full-year committed course, to sacred tours and now retreats. My work is now also available through CDs, book, publications and videos. It is currently moving towards developing towards laying the foundation of what I have taught over the past 10 years and refining them into a complete system which may transcend into a centre sometime in future. Not so clear with the phrase "Brand of Spirituality", spirituality to me means "Harmony in all aspects of life". My work is also moving towards live performances which recently in June Summer Solstice played in the Forbidden City Beijing China for the Flower of Life Ceremony Fashion Show. The latest happening in what I am promoting and doing is introducing the Power of Sound Healing to people in Singapore and spreading the knowledge and skills on how to speak and use and Language of Vibration in people's spiritual practices. Before I started teaching in 2004, years before in my days of exploration, it was difficult to find like-minded people and spaces where we can gather and share freely without concerning people around us would think we are crazy. The holistic scene is evolving rapidly and will continue to do so just like any other industry. But because it is a small network and community, it will take some time before more unity consciousness as a whole in Singapore can be experienced. The lightworkers in Singapore has been supporting and doing their work to spread the seeds of awakening for so many years and it is all thanks to them that in the near future we will be able to enjoy the vast availability of uplift programs people could attend and upgrade themselves. In the near future, I foresee collaborators in Singapore of all kinds - organisers and facilitators coming together to share and co-create. It is certainly a wonderful and beautiful time. What changes have you seen over the years in this business in terms of receptivity, enthusiasm and interest in your work? There are many who too are interested in the nature work of Sound and seek to discover and practice further. Such interest usually gravitate towards the idea of carving a career in the field of spirituality. What have you learnt on your travels and retreats abroad? No matter where I go in whichever part of the world and methodology i use in my work, the subjects people ask are the same. It includes: Health, Wealth, Relationship, Property, Marriage, Communication, Career and Spirituality. Though most of the time the priority on the subject of Spirituality is low. The highest and most asked questions are often related to relationships, Health and Career (Wealth). As such the application of my work which uses the Universal Laws to explain and resolve has shifted from using esoteric terms to psychological and scientific terms. Using references and examples from their daily activities are of the easiest and fastest response to resolving often a mental issue. In comparing to Asian scenes, the U.K, U.S. culture and people are generally more adventurous and ready to jump into exploring new avenues of self-development. The mindset of theirs are more open and see spirituality as a means to resolve something deeper and are not ashamed or shy to tell a friend about it. In Asian scenes, perhaps in our culture there is a program that indicates if you are attending meditation classes or seeking a private consultation, it is either you have mental issues or depression, or are dealing with negative energy entities in your life. However now, international traveling is extremely convenient and affordable for many, it has helped made the line between the two much lesser distinct than before. Asians are generally more open now and are willing to mix it up with others which softens the boundary between different races and cultures.An opened heart certainly creates new bridges. How big is Singapore's demand for retreats from what you understand? There is a general healthy demand certainly. Singaporeans do enjoy being pampered, and should a retreat give an extra treat with a rewarding bonus in their spiritual and material life, it will certainly be a hit. We need to be able to communicate more openly, honour and respect each group and share within the allowance from each organisation. The unity of individual centres can draw a greater attraction and become a brighter and bigger light bulb where people can see, including others from abroad! Having the local media support by placing the holistic market in the radiant limelight as frequently as possible and adding a new dimension of well-being to Singapore! To be an inspiration for others and in their own ways thereafter inspire others in their community. To meditate with as many people as possible in one single sitting for the pleasure and purpose of being and allowing. In ways that are so creative that is beyond imagination; Continue to strive to be eco-friendly, nature inspired and uplifting for the citizens here and tourists. To have successful, eventful gatherings and conferences that will serve as a catalyst for many to be inspired for their own growth and path in life no matter how big or small. Ruby Ong has helmed Reflections Bookshop and Resource Centre under the unforgiving economic climate of Hong Kong for the past 16 years. The sole proprietor started the business initially with partner Jonnie Oden, but tragedy struck four months into their first year when Jonnie succumbed to the cancer that she had been fighting. Ruby was left to shoulder the young business alone, on top of her other commitment to her own public relations consultancy MV Reach Communications which she had established in 1991 as well as that of Reflections. We last had this discussion at her Centre in 2013 when I first declared my intention to interview her. We were tucked away high up in an unassuming corner in an easy-to-miss office building on a side street peddling sharksfin and fish maw in Sheung wan. Her centre is exactly one of many conventional office spaces, thin blue carpet, white bare checkered ceilings, partitioned walls to make out three rooms, one office for herself, one room for private consultations and one storeroom. The main room is lined with low bookshelves packed with new age books. A wooden table and a few office chairs form the centerpiece of this little space. All this is very no-nonsense, very Buddhist, very zen, just the picture of Ruby herself, consistently in shirts and cropped black pants, her face humble and completed with an enigmatic smile. We are finally having a teleconference to put her whole story on record. "After Jonnie died, I decided to continue. Even as I was frustrated and I had no money, I told myself, 'Ruby, don't quit'. I received a lot of signs from the divine at that time encouraging me to keep going. [Jonnie and i] envisioned a lot of things for Hong Kong. Recently one medium who came through shared a reading on Jonnie. The medium said my partner was happy with what I have done and assured me she’s here to protect me. In a lot ways I’m blessed by the divine.They always guide me." Ruby contemplated closing again in 2011 when her last tenancy expired and she was unsure where she was to go. From November 2011 to feb 2012, she searched for her new centre, always wondering whether to keep going. holism, "this is not the business to be in if you want monthly high pay, save a lot of money and live comfortably...With this kind of work, it’s different..we get joy and happiness in different aspects. I’m after the spiritual awakening of people and I hope people will be happy with what they have." And Ruby knows what big business is like. She worked for PR multinationals like Hill and Knowlton and Edelman twenty years ago in the early days of awakening China. She was a totally different person back then. "I never thought of opening a shop like this. I worked in China for 2 years. I was a PR consultant, I never thought of all these things..I was aggressive. I knew I’d grab 1-2 business projects every cocktail party. Business kept coming. I was happy. my mom got cancer, my father died of old age, my sister-in-law died of cancer. It was shocking and depressing- a big blow that awakened me. At that time I was still wondering about my life, I had my job waiting for me in china for 4 months. I then started to reflect on life...on hindsight, that was my life path, also why I call my shop Reflections, some people never awaken, no judgement about that, they are on their life path." Ironically, an ex-colleague she met a few years back said she hadn't changed much. "We don’t call ourselves new age, everything is ancient wisdom. More people are open and receptive in HK to this idea of spirituality, natural healing, new age, yoga and meditation. We now know that there is more to meditation than relaxation. Some think yoga is a physical exercise, yoga can help with the emotional and mental too. People now are open and receptive. When you talk to them, they’re open, accepting. People go to extent to research. It’s good. It also doesn't hurt that we have $7m people in HK"
"I've noticed a younger and younger clientele. More social and civic consciousness. And more interest in spirituality. I have encountered many very spiritual and sensitive young people. There are different people in this market. Malaysians are more affected by religion. Chinese are more Buddhist. Malaysia has a lot of Tibetan Buddhism as opposed to traditional Buddhism. Everywhere is different. (Pause, she adds about having to adapt to technology changes) My Facebook was set up by young clientele. Our website was redesigned by very young clientele. I don’t go into all these things. Recently I got a Samsung smartphone. Now I have Whatsapp, Wiichat, Viber. Sometimes this can keep me very busy. Reading answering.. reading answering. You have no time for yourself." readings and guidance. They make up 40 percent. Then we have those who come for learning, enrichment,skills and DIY like Buddhism, workshops to empower, they make up 60 percent." many other centres on Hong Kong Island and the Kowloon side. Many young Chinese are opening up centres for the young office ladies market. We hope they will bring them to the spiritual market and not focus too much on tarot readings only. We hope it will bring them one step further. Of course it is up to the owner or person in charge. We attract the kind of client and consciousness that are like us. The Young will attract the young. On how to grow the market, "Education as an industry is the key to that. People have to go through traumatic experience in order to awaken. We teach people they don’t’ have to feel the pain first or lose something, marriage, a loved one..to turn to spirituality. We pray that people will awaken sooner than later without going through loss or traumatic experience and become more aware on how to make life fulfilling and meaningful. They have to realise they have to live in the moment. You are most powerful in the moment." On her principles of price-making,"
We take the opinion of practitioners and my experience with the market. We check with the divine and trust what is the number. affordable for clients. It’s a matter of feeling." "A lot of people will still be awakened.There will a market for everyone. No need to fear. Whatever is yours, divine will send to you.The divine is very good and will send the right people to you all the time.Trust and be aware." "The more you talk you know you need to be humble. The moment you are teaching you are learning. You realise so many things you don’t know.In face of the divine, we are nothing. Ask for guidance. Humility is very important. Spiritual teachers are put up on a pedestal. Before long they get mesmerised and fall from glamor. Some up and some down. Our hope is we only climb up. Some will fall or climb down, not aware of it. They think they are correct and right. Although no right or wrong. Some who are falling don’t know it. It is important to go home and reflect. Did I say something wrong? Did I do things wrong? If I feel say something wrong, I apologise immediately the next day if I hurt someone. A lot of people are not conscious. I’m sure you know so many teachers who are authors, who teach and talk. You can feel their Ego immediately. I once had a practitioner who insisted on having a projector in his class. We don't have one so I found one for him. It did not make a big difference to his turnout. Buddha only had a Bodhi tree and a rock and hundreds and thousands showed up to hear him speak. How can you teach when you do not have visual aids? You need to be flexible and creative. go out and do service. In HK I have 4 master teacher level students already. In Beijing I may have a few also soon. My father always said Qing Chu Yu Lan (mandarin for the student surpasses the teacher). I encouraged my students to be better than me. You may be better than me and it’s alright. My mom said, "When you are arguing, always leave them a space to step down. Don’t push them to a limit that they have no place to change and turn." see if their services warrant the fee. They can feel the enrgy of the practitioner when they receive the email. They are not attracted. things will not flow for your life. the highest good of you and all concerned. On how she has brought spirituality into her business, " It is a common practice to put the bottom line first. For me, it’s important to pay bills and to have money to fall back on in case you need it. It does not have to be millions and millions. Just some money to live your life comfortably. One of our UK practitioners who just left said to me, 'We need to pay bills. We need a roof on top of our head. We need food to keep our belly full. Personally I feel we still have a physical body, temple of soul, it needs to be fed, clothed. It still needs money. Anything that is free, people don’t value. Usually our price angelic numbers 111, 222..
It’s nice to have price like that. There are a lot of good people in HK doing meaningful projects asking nothing in return. They are not aware that their soul is awakened. On TV I have seen a hawker who offers congee every morning to a group of elderly people, rain or shine..for free. 'I don’t need a lot myself. 'He wants to share. This is very simple. He doesn’t know spirituality. He doesn’t have to be sophisticated, chanting om, shiva, or going up to a mountain to meditate. When you chase after something, like money, you get very tense. I told the divine I don’t want to work under pressure anymore. Help me find a space I don’t have to work under pressure to pay my rental. Really I don’t work under pressure now. Interestingly, without working under pressure，things keep flowing. If January is empty, the center later fills up gradually. Things just happen. I have to be invited first. The Divine works mysteriously and miraculously. When certain things happen there is a reason. Whoever is not suitable to be my client, I can feel that the divine will make things happen so that they have no chance or time to come. I don’t do much now. very straightforward. I will tell people if things will work or not. It is not personal, just professional service." Her advice on how to work with the Divine, "Ask the Divine, 'how do you want me to serve you.' Step out if you want to serve. Make it known. On the evolution and changes in her work, "I have been teaching Sekhem since 2002, it’s been 12 years. I also offer healing and mini workshops when I travel. not sure about the near future. meditation for forgiveness and distance healing. Every moment we are going through initiations. Actions you take in the face of initiations depend on awareness and consciousness. Every day I’m evolving and changing. I also tell my students. Everyday we take action and make decisions. What you say and think are important. How you’re feeling is important. Sometimes we evolve up, sometimes we evolve down. We pray we won’t go back, we pray we get closer and closer to what the divine wants us to do. and we are here to provide them with resources, sometimes for free, to get them started." This month we profile another dynamic duo in Singapore's healing community Vikas Malkani (above left) and Sally Forrest (above right) who have been operating Soul Centre Singapore for the past 10 years. Sally Forrest talks to Evolve Asia about their journey. How do you usually introduce yourself and your line of work to lay people? Our purpose is to inspire people to bring out the best from within and to simply be the best that they can be. Vikas is usually known as a best selling author, inspirational speaker and life guide. Sally is usually known as a Reiki teacher, Feng Shui and BaZi expert and an inspiration to women . What are the common responses? WOW thats interesting - tell me more . How long have you been interested in your specialization? Our stories alone would fill a book ! In short we were guided to each other in the most amazing of ways ! I was a very successful executive working with the Boots company and my whole life focus at the time was the next promotion, bigger car / house etc etc ...I was asked by Boots to go to Thailand and to open the retail Boots stores there. I did this and loved every moment as it was fast paced- positive and we were giving jobs to many people and opening 70 stores all across Thailand in 3 years. After 3 years Boots asked me to return to the UK to support the downsizing of the company head office ...which means making people redundant. My work permit depended on this and so I returned ..but each morning as I woke my heart was dying ..this was not the job for me .....so after 17 years in senior roles , one morning I woke up and I quite my job ! It was here whilst dealing with the hill tribes that I realized people have no access to medicine yet could heal themselves ....as a medical pharmacist this was fascinating to me and it was the start of my journey of the mind-body connections. To cut an amazing story short - a friend in Singapore gave me a flyer about a visiting Indian Master called Vikas Malkani . I did not intend to go , but on the day of the talk as I moved some books on my coffee table- the flyer fell out and it was that night ..so I went ....and was amazed at the teachings. I went to India later that year and was sitting in his office explaining that I intended to open a business in Singapore , when his phone rang and his current Singapore promoter was moving to Australia for 3 years , but one of her concerns was who would support his work. He put the phone down and said - lets combine strengths and open SoulCentre in Singapore. That was in 2003 ...and of course I said YES ! Vikas was the CEO of his family business - when at the age of 29 he had what can only be described as an awakening / higher awareness experience. He started to simply talk to people . More and more people started to come and so SoulCentre was established. We opened SoulCentre in 2004 in Singapore. Tell us how you chose or were chosen for your line of work? We were both on our individual journeys of self discovery. We certainly were guided and each realization led us to the right opportunity and the realization we need to share and help others. So it was a natural progression of our own journey of growth . When you find a precious treasure ,you want to share it with others. Once we received something of such immense benefit,we wanted to give to others too. What experiences led you here to where you are today? What decisions did you make? What trials did you face? We both left the corporate / business world and ventured out on our own . The combination is amazing! We decided to bring SoulCentre to Singapore and to offer high quality,professional, genuine ,tried and tested wisdom and techniques in a premium space to our students. The initial few years were tough ,but we never doubted our vision and stuck to it with total commitment. Of course the corporate world is certainly the "easier " route , however we knew once we were established then it would be well worth the effort. Our work constantly evolves. We are blessed that so many happy students come back for more learnings and recommend others. Our Children's brand - SoulKids(R) is focussed on giving children vital life lessons on self confidence / self belief and essential skills at a young age . This is expanding globally now and additional SoulKids centers will soon be opening in Singapore. Our belief is if we can impart valuable life lessons in children at a young age- then they will certainly have less turbulence and issues as adults. SoulCentre is also expanding internationally - with 3 main specialisms - Meditation, Reiki and Life Coaching . It is so rewarding to see that people really appreciate the professionalism and quality of the training we provide and want to take it to their own countries . The wisdom of truth has always been the same. The truth is what does not change. However the ways of communicating are always evolving. Of course the ultimate goal is to be equanimous no matter the storm of life . we live this principle of being equanimous . We actually do not find any blocks . Once people meet us they see the authenticity and the truth and join us. Tell us about your understanding of the holism scene, how long it has been around and where it is headed in the near future. Spirituality started to become more mainstream in the 60/70's I guess. Before that it was limited to serious seekers who had to go and find the truth. It will continue to grow and expand in Singapore and all over the world. People are very receptive to our work and usually send their partner and family along once they have tasted the wisdom. Our work continues to grow year on year . Today we are a committed ,successful centre and a brand that is recognized internationally and not just in Singapore for the high quality of spiritual work that we do . 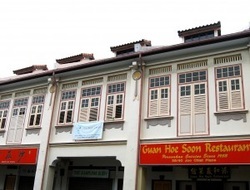 What were and are the roles of foreign practitioners in Singapore? It's great that they come and visit , the market needs all sorts of practitioners and disciplines. Do you think there is a dearth of local practitioners? Why? We do not think there is a dearth . Many of our certified teachers and experts are local singaporeans. We find that they can always find their niche in terms of timing / location / types of students. We actually think the market is growing as a result. What do you consider to be the three most difficult experiences you have encountered in starting and keeping afloat this business? 1)Finding a great location that is affordable. Rental prices in Singapore are a huge issue - rentals can go up as much as 25% on renewal. 3) The fact you have to juggle time between running a business and teaching . It is of course a very different role when you are dealing with corporate compliance compared to inspiring others through teaching. It wil grow organically as more and more people see the need for holistic wisdom and techniques to support their health,happiness and abundance. Whatever is done and communicated needs to be done in a professional and authentic manner . What do you see your role as a centre in the holism community? We believe we set a standard of professional work and authentic wisdom that is a benchmark for the industry. We often speak at SME events as the SoulCentre and SoulKids brands are seen as ones of excellence. I am also on many committees in Singapore pushing professionalism and good practices of running a business. SoulKids was also featured at the recent Marina Bay Sands Franchising and Licensing show as part of the opening ceremony . Both of us are Certified Franchise Executives , having undertaken a 2 year training course , so we are now experts at licensing and expanding the business internationally. Do you consider the market saturated for centers in Singapore? The market is always expanding , so there is always room for growth. However only the good ones will thrive and flourish . Not many will make it past 10 years. What advice can you give to aspiring practitioners from your past experience? Work on yourself with dedication and discipline until you have transformed. Only then help others. Stay close to your teachers and sources of wisdom .....just like a mobile phone , you too need to be charged regularly ! What are your thoughts on the issue of commerce and spirituality? Do you think that practitioners are bad if they charge and worse if they charge higher? Do you think that our services are too pricey in general? One should judge the teacher on the quality of the teaching and the professionalism they demonstrate. As they say , the price for a good product is soon forgotten, however the quality is cherished forever. Our students find great value in what we offer and come back to us again and again . How have you reconciled the two in your life? For us there has never been any disconnect between the 2 aspects. When you see the big picture you realize that all aspects are a part of it . We intend to reach out and support more people to reach their highest potential for happiness and abundance. We are expanding both in Singapore and globally . We are always looking for like minded passionate people to work with us on expanding our brand . Do you think your brand of spirituality will have a space in the mainstream in time to come? It will only get better ! This month we interview Elaine Grundy of Reiki Centre in Eastern Singapore and profile her near decade dedication to reiki, the business, the history and her wise advice to aspiring practitioners. How do you usually introduce yourself and your line of work to lay people on the street? I usually don’t even mention Reiki (with a smile). I say I run a wellness Centre and if they seem interested then I talk about how I teach Reiki, an energy balancing system – like meditation. Most people are happy with the Wellness centre response and move on. The ones who show an interest in this tend to be more open to holistic therapy in general and so we can then have an open conversation about Reiki. I have learnt over the years that Reiki is not that interesting to most people, hehe. I was lucky enough to be introduced to Reiki over 20 years ago and have loved it from then – being a self-healing modality first and foremost means I have benefited enormously from its gentle balancing energy, even when I have gone through periods of not teaching. I have been teaching Reiki since 1996. I started out renting rooms from hotels or clubs before moving in with Basic Essence when they started business. I founded the Reiki Centre in 2007 as a small studio in River valley before moving to our two studio East Coast premises in 2010. Tell us how you chose or were chosen for your line of work? What experiences led you here to where you are today? What decisions did you make? What trials did you face? It’s really been a progression, Reiki was a very personal journey in the beginning and I started teaching in the weekends, probably only 3-4 times a year as people asked me. I stayed in my corporate career for 10 years like this and slowly demand grew and I just went with it. When Randy and Jac asked me to join them at Basic Essence it was a really big push to become more ‘established’ – I am so grateful to them! The big decision was to open the Centre, I remember being very nervous about that – but by then I was pretty well established so I knew that my classes alone would pay the rent. My attitude is always to be shown the work first before moving into it – by that I mean it’s a ‘pull’ into the work as its already evolving, instead of just opening a centre with no clients or experience and then having to ‘push’ your way into the market – that’s always a recipe for disaster! Reiki is always evolving and since I started it has definitely shifted into the Holistic mainstream. Many more people search Reiki directly and most people find me through search engines, as they know exactly what they are looking for – that’s a big change from 10 years ago when Reiki was still relatively obscure. I think the next stage is online healing and teaching, but we’re still a bit behind that curve – mainly due to the resistance of the Reiki teachers – but it will come within the next decade. Actually I have found Singapore extremely supportive and open to Reiki. The high stress environment and the openness to healing through anything ‘chi’ related is already very well established compared to Europe or America, so people in Asia embrace energy healing much better and with a more open mind. The gentle self-healing of Reiki and the fact you can empower yourself is also a big draw for people here. Sometimes I come across some resistance when they think Reiki is a religion or belief system but that is about it. And of course a large portion of the population is not open to energy healing at all as they don’t feel it or can’t see it, but that’s the same across the world. I started teaching here in 1996 so can only comment from that time frame. Back then there were only a few Reiki teacher’s here and a big name from Australia, Barbara McGregor who came over and did huge classes – so it was a relatively niche thing. Certainly we didn’t have the breadth we have now – it's amazing to me how many wonderful therapists, teachers and modalities we have now – I think we can pretty much find anything we want now! Back in the 90’s it was not so and you usually had to travel to other countries to learn more obscure therapies or find out about other types of healing. I think it will continue to expand for sure. I’ve also noticed the quality is growing and you can find an exceptional teacher or therapist in most modalities here without having to go overseas anymore – that’s fantastic to note and its always a good sign when students come in from Malaysia, Indonesia and Brunei to attend classes at the Centre as it makes you realize Singapore is becoming a regional hub for holistic work. Huge difference! The free talks and Reiki meditations are always well attended by all walks of life, there is no age, race, religion barrier with Reiki and that’s one thing I am always so grateful for – at any talk you have a huge variety of people, the one thing they have in common is an open heart. I’ve also noticed corporate HR interest has increased over the past few years and I get invited more frequently to talk in offices and organisations. In the past, to be honest, we relied on foreign practitioners for their experience, expertise and training – they had to come in to train us, or we had to travel to them to be trained. My personal feeling is that this has really changed and we now have our own home grown talent (hehe I say ‘our’ as I consider myself a non-foreign talent ;-)) Now when people from overseas come to Singapore and expect to be able to just attract people I am always asking them what they can bring that we cannot find here? Its getting harder and harder for them to give me a reasonable answer, and I think its harder for teachers from overseas to just come here and expect full classes. 1. Rent! But on the flip side, the affluence of this city allows me to charge more than I could in a country with low rents, so I guess it evens out, but it’s a tough one. 3. My time. I do this part time as my family comes first. I run the business from 9-2pm and then some weekends for classes but the rest of the time is dedicated to my children and home duties. Its tough to run a business part time! I think it’s growing quite well as it is. If we, in the holistic market, all focus on our own spiritual growth, others will follow if they see us growing, and at peace. It’s a natural thing to be attracted to those who have what you want – so I always feel that for those in the holistic field we need to really shine the light, and be the role models. If we can’t do that, then why would others want what we have? If we can’t attract clients or students, if we can’t make money or grow ourselves, this says more about our own internal growth than anything to do with the market – if we all focus on being more peaceful, kind and loving, the rest will follow. I don’t see I have a role. I am here, and anyone who is attracted to what we offer is very welcome to join us. I don’t really have any higher aspirations than that. For me I am just delighted I get to do what I love doing every day and get paid for it. Absolutely not. But I do think many centres open with totally unrealistic expectations and the Kevin Costner ‘Build it and they will come’ mentality. People only come if you are offering something they want. Many newly trained teachers and therapists think they just need to hang up a sign and people will flood in – but where is the attraction? If you are a new therapist or teacher my advice is to build your client base first, once this is solid, then open your centre when you already know you can make the rent – that is the process for longevity, the 10,000 hour rule. Or if you are not a teacher but want to open a centre, make sure you have well-established teachers joining your centre, and the same success will happen – but you cannot open a new centre with no clients and not expect a bit of an uphill battle – then it will take you at least 3 years to become established, so do you have 3 years worth of rental cash to keep yourself afloat? The second thing to consider is your niche – every Centre here has a niche and its own unique energy – we all draw different clientele and this is what allows us to stay successful – if we are all fighting for the same pool of people its very difficult. So you have the big players like Pure and True Yoga and then you have the niche Centres like Reiki Centre, Basic Essence, Golden Space, Gallery Helios, Balanced Living, Soul Centre, and of course lots of small yoga and pilates studios – we all have very different vibes. So any new centre, unless you are going huge, you have to find that niche that you feel totally comfortable in (and you can own as your own), and then really focus on attracting the right teachers and therapists that are aligned with your vibe. I have a lot of teachers approach me wanting to teach at the centre and often the answer is no – not because they are not great teachers, but because I know their vibe is not right for the centre – we have a very specific niche and its something I work hard to preserve. 1. You master your profession after 10,000 hours of practice. If you remember this it will keep you focused on gaining experience as a priority, and keep things in perspective. 2. You have to be one step ahead of your students/ clients so make sure you never stop doing your own personal work. If you think you know it all, or are ‘done’ you are in big trouble! You need both to be nice and balanced. Keeping the balance is not easy, for sure, but it is a balance and thinking it is one or the other or that it cannot mix is absurd. I come from a corporate background so perhaps I have a different perspective than others on this. In my corporate life it was normal to value your time. A company pays for your time, and in exchange you give them your productivity on certain hours as agreed. This is how I view what I do, people can come to me, I am available for teaching or healing but I greatly value my time – I have two wonderful children that I could be spending time with, and a whole bunch of other fun stuff I could be doing. Reiki is not a duty to me and it’s not an obligation. I do it because I love it, but I don’t feel the urge to do it for free. One day that might change, and I may find myself with much more free time, maybe when the children leave home, and I‘ll be happy to give more hours for free. But right now that is not the case. I also have some hefty bills to pay, rental to meet, salaries to pay and this all needs to be taken care of. I see this as just normal concerns – I’m not sure why you have it under an ethics section as it has nothing to do with ethics in my opinion. If healers can attract clients at higher prices, then good for them. Is it always worth it? Probably not. We are pricey in Singapore for sure, but that’s because we have higher bills to pay – if my business was in Malaysia or Indonesia I could afford to charge half what I charge here because my bills would also be half. It’s never been something I have had to reconcile. Some people do come to me and ask me why my teaching/ healing is not free and I simply direct them to the free Reiki sites on the internet. Personally I think Reiki is mainstream already, in terms of for those who are interested in self-healing. I think we are still generations away from a really mainstream grasp of holistic therapy in terms of the average man on the street. I have a bigger wish for the teachers within my profession to use Reiki more intentionally for their own growth. I do think a lot of Reiki teachers are not very evolved spiritually and I think that is why for many people they don’t see Reiki as very ‘powerful’. That is a shame as my personal belief is that Reiki is a very well trodden path to enlightenment. I hope people continue to grow towards the light, to recognize that inner peace is realized through the self and not through the external focus of gathering ‘stuff’ or trying to control life. It would be good if people here relaxed and smiled more – more hugging is always a good thing. We know what your typical branded SME towkay is like. But what is a branded SME towkay holistic guru with two Successful Entrepreneur awards and an Outstanding SME 150 Enterprise Award 2013 like? There is no contradiction between wealth and wisdom for Umesh Nandwani who runs Golden Space, the centre he founded with Sushila Devi (Co-founder) since 2005. "Things have changed. You can be rich in both worlds." The spontaneous interview takes place between his traveling engagements to his centre in Kuala Lumpur, Malaysia, the UK festivals, his students (and future business partners) in Indonesia, the United States and the United Kingdom. Like an old-school towkay, he's not much into email. Yes, gone are the days when being spiritual entails material deprivation and being wealthy implies soullessness. "A shift is coming in 2015," he promises. The man is his own walking advertisement for his 8 step programme to 'Awaken the Divine You', and that is a very enticing proposition, if you remember the gongfu stories of old where a disciple had to spend years fetching water from the bottom of a mountain before the master would share one secret. But now he is offering it to you readily. And he tells you you can have what he has, if you trust and are willing. And he has the claims to his name- a psychic, astral traveler and a divine channeler of the higher order. He has adopted towkay hokkien, which is always interesting to watch coming from a Singapore-born indian who did not have an easy childhood, reclining and boasting about numbers. You cannot help but admire his magnanimous acceptance of fate, and lack of hate, whether you call it localisation or integration, this was a boy who grew up with the double difficulties of racism and poverty. Bullied in the schoolyard in primary school, beaten up because of the colour of his skin, and he shrugs, something you cannot change, "was normal". And he almost caved in too, the earnest, eager, almost child-like man, in his 50s, was once depressed, almost committed suicide four times, "twice in the pool, twice in the sea". What helped him get through these difficult times were the little inexplicable miracles in his life, that he did not understand then, like when the tiny boy suddenly raged in primary six against his bullies, "and whacked them all". Or when a coin materialised out of nowhere as he prayed for a coin to buy a present for his brother. When grimness visited upon him again in 2000, sending him to hospital, he found a guru from India in the newspaper, who became his guru. He signed up during the group seminar in a trance and asked for a refund when it wasn't to his liking, only to find himself signing up for the next seminar and the next. The guru helped him to make sense of his latent abilities, his dissatisfaction with life and armed him with a renewed sense of purpose. Armed with positive intent, he started sharing his newfound knowledge but again and again met with obstacles. He first had to break with his family business, which was a very difficult thing to do, with their lack of acceptance of his work. Then when he finally got things going, was disenchanted with the Singaporeans who came to his classes. First it was the name which had to be changed because "ShivShakti" was perceived as an Indian centre. Then, he used to ask for donations in lieu of payment only to find people barely giving anything, barely enough to cover the hourly rent. "They can give you $2," still incredulous of the lack of appreciation and disrespectfulness after all these years. And the rent loomed large again in 2012 when it came time to renew his lease at his Craig road headquarter in Singapore. "I almost gave up. Wanted to shut it down. It is very hard to sustain in Singapore"
Things turned around in recent years, "establishing the last 10 years was the most difficult, " as his happy students come back to support him, and partner up globally. "I'm building a team to take over me. They're a good team. I have my spiritual work. And i have the centres around the world." Umesh is at peace after a bumpy long ride and looks upon the future with great anticipation, expectation and vision. "The new age is about taking your own rights and taking your own responsibility, without blame." And he has hope for Singapore. "Singapore is highly spiritual. But people must wake up to who they are. This means being authentic and true to your higher self by being less negative, more positive. Finding your true heart and being sincere. " He cites the great shifts in civilisations and predicts the coming shift in 2015 and the shifting of spiritual centre from India to South America. It's all very plausible the way he explains it, shades of Yogananda. This man just may have found the golden mean between spirituality and business. It will be 10 years next September after Ambika Menon embarked on the journey that is Sanctum. Evolve Asia catches up with Ambika for her insights into the community and a look back upon her journey and vision for the future. Here are excerpts from the dialogue broadly categorised into key questions. Generally I simply say I operate a healing/meditation centre; it seems to be more acceptable and easier than trying to explain the concept of a “holistic” centre. I would explain that we provide services such as yoga, meditation and complementary medicine. With those people who are familiar with such establishments, I might choose to expand on some of the more esoteric aspects of the work we do, but only if they show an interest and ask leading questions. Generally, those not familiar with centres such as Sanctum would probably ask more questions on the yoga and meditation sessions. That is always an ice-breaker! People have been puzzled or intrigued by the idea of such places in Singapore. Then the inevitable question of is it profitable or is there a market for such services. Some do occasionally seem perturbed, probably comparing it to some of the more extreme examples of occult shops abroad. Those who know obviously would be more interested in obtaining more information about the range of services being offered. Those who are comfortable with meditation and perhaps some forms of alternative healing may be curious but others would generally be more reserved and immediately ask if it involved the occult, with the implication that of the less savoury variety! I have had an interest in metaphysics from my teenage years. As you learn and evolve with your understanding and experiences, you eventually create a philosophy that is tailored to your individual personality. That is the guiding principle that i use when i share my personal journey whether in casual conversations or formal workshops. Was I chosen? I don’t know; I do know that very interesting circumstances happened in the space of a few years that completely revised my expectations of how my life would turn out. Some of these experiences were painful but with the wisdom of hindsight I can now see that they were the turning point when I began to see the possibilities and not just dismiss this venture as a pipe dream. The old adage about people who are in your life for a reason and a season contributed to both the sorrow and the joy/excitement of finally seeing a concrete way forward. Everything I have achieved and accomplished are largely due to their influence. Deciding to leave a full time job after 20 years, beginning a business from scratch with no prior experience or knowledge, having to make difficult decisions on whether to continue or give up when the going got tough are just some of the challenges I faced and am still facing. Maturing psychologically and emotionally in ways I never knew possible was very unpleasant! But I could have never have had as much satisfaction and known the level of peace that I have experienced in the last 9 years if I had continued as I had been before Sanctum. What the future holds I truly don’t know, but the journey thus far has been worth every mistake and loss. Most immediately I can say that over the years I have gained a lot of confidence in my own abilities and learned not to be attached to outcomes. I am more at peace with myself and no longer worried about the presence or lack of clients and the stresses of managing clients. Sometimes it is difficult to gauge a client, if you have been helpful, you will never see the client anymore since they have found their answer and moved on. If you have not helped, you won't see them for sure. Thankfully we have enough repeat clients and the occasional clients who kindly contact us with positive feedback of the help we've given. It helps to speak my truth, everyone has their own style. Like attracts like and there is no such thing as any(one) or centre being better than the others. If Sanctum has a failing, we fly too low under the radar, people don't know we exist. We're still resolving the fact that it is a business, it's not a non-profit organisation, we need to be focused on scaling, getting people to come here as opposed to somewhere else by virtue of what our centre practices. It's not grocery or electronics. Here, facilitators and clients must have compatibility, like a marriage. I hope in my lifetime to relate the philosophies and beliefs that make up a holistic healer relevant to a person on a daily basis. About the sceneWe are fighting forces on the outside and inside. I feel that we most definitely have a tendency to be cultish, because of competition over a limited audience base and negativity will unexpectedly arise. It's always ironic for a bunch of people who call themselves light workers all about truth and love carrying so much negativity. But i don't exempt myself. I've been reading this book by Thomas Moore, "Dark night of the soul", and the book acknowledges that these are aspects integral to who we are. I have not formed an opinion on the industry but i would like to see more discussions and work done about the integration not the absorption of dark into light. Every healer has his or her bad days and each centre has its own distinct identity. Constructively, if we work together behind the scenes, the support we can lend to each other and clients would be immeasurable and will give the whole industry a better reputation also. What are your aspirations for the industry moving forward? I hope we can take the mystique out of the whole industry although the element of mystery is part of the charm and attraction of it all. I feel that it will always be alternative as opposed to traditional mainstream beliefs but it shouldn't be alternative because it is cultish or exclusive. By giving people the freedom to browse without feeling that they need to be chained for life to a centre is one way to make our industry more approachable to wider audiences. This is the start of a continuing series where we document the region's healing landscape and the driving forces, personalities and motivations that sustain our community. For 14 years, Jacqueline Yu and Randy Ong have run Basic Essence, a holistic wellness centre located in Singapore, dedicated to the promotion of total well-being for health, beauty and personal growth. Evolve Asia catches up with the cheerful and cheeky partners for an insightful look back upon their journey and vision for the future. Randy: I run a holistic wellness center?? Jacqueline: Sounds interesting, what EXACTLY do you do? How long have you and/or your partner been interested in your specialization? Jacqueline: It was for health reasons that first led me to seek alternative treatments. Second, it was the passing of my dad that led me to question life, death & after-death. I started seeking for answers. Found yoga, meditation and reiki. The practices helped me to rebalance my body, my health improved greatly, even my skin started to look better. More importantly, I was able to gain inner joy and peace. During a trip to Byron Bay, Australia which is kind of a hippie town. I was so inspired by the energy there and came back with many ideas for Basic Essence. It was rather smooth sailing for us. As soon as we started Basic Essence, many practitioners and facilitators came knocking on our door. We did not even need to look!! Time was perfect. The energy was very supportive. Tell us about your work, how has your work evolved and where is it headed? From a ‘new-age’ center, we have embraced a more holistic lifestyle and our focus and specialization now is in Traditional Tibetan medicine and Tibetan art of healing. That's interesting, how and why did you choose tibetan healing and yoga as your centre's specialisation, particularly since Jacqueline started with reiki, yoga and meditation? Was it fate, coincidence or connections? Jacqueline: Somehow I have been drawn to all things Tibetan, the sights of prayer flags flying in the blue sky, the Himalayan ranges, the grasslands, the sound of singing bowls, the chants all invoked in me a sense of inner peace and a sense of being home. It must be a past life connection, as nothing is coincidence! I have been very blessed to connect with some great Tibetan masters in deepening my spiritual understanding. When I was looking to deepen my holistic practice, I was immediate drawn to learning Tibetan medicine due to its innate connection with nature and its theory of interdependence and interconnection. And meeting Dr. Nida Chenagtsang and learning Tibetan medicine and mantra healing was pivotal in my spiritual growth. Everything becomes crystal clear for me and I was able to fit in my puzzle piece in this world. And I loved that spiritual practice is all part of Tibetan medicine. We have started to teach Tibetan Healing yoga – Nejang. This yoga comes from the Tibetan medical tradition especially for healing, to rebalance internal energies, cleanse the channels and relaxes the mind. Many Singaporeans still think of Tibetan medicine as some sort of rituals perform by a monk. It is quite far from the truth! Traditional Tibetan medicine is an ancient science that is based on the theory of interdependence. It is the theory of how nature arises from the five elements and the five elements are the basic structure of our energy, body and is connected to our mind and emotions. Many Singaporeans will opt for alternative treatments as a last resort or look into spirituality only when they are hit hard by challenges in their rat race life. What do you consider to be the most difficult experience you have encountered in starting and keeping afloat this business? The most difficult experience we had was to relocate after having been in Holland Village for seven years. The rent went up too high to allow us to continue operation there. Human nature has not changed much, so there are not much changes in terms of how people perceive our work. When the time is right for them, it takes very little for them to show interest in your work. But if it is not the right time for them to ‘awaken’, they might not even notice you. That simplicity is bliss. Especially when you travel to places where life is hard but people are genuinely happy. You realise that happiness does not equate to material possessions. True happiness comes from understanding your true nature. Sure, UK and US may be more ‘established’ in terms of their new age offerings and modalities. But I think the Asian and Singapore scene are also unique in that we are very much exposed to local cultural traditions and rituals of healings. These rituals may seem exotic to the Western world but are indeed part and parcel for Asians. We need to start young. The children and youth need to be exposed to more holistic lifestyle and an understanding of what balance means in life. What do you see your role as a centre is in the holism community? We see ourselves as the bridge to connect people back to their balance of life and to their innate spirituality. As a holistic wellness centre, we want this place to be a place for people to heal, to learn, to re-connect to their true nature. It will also be a place to support people in their personal growth. There is always space for more centers. Different people will be drawn to different places at different time. With passion, work with integrity and honesty. The well-being of the clients should be placed first. Yes, I think so. But it may be some time yet. That Traditional Tibetan healing and holistic healing will not be a last resort for people. Rather, holistic health should be also a way of maintaining balance, not just for recovery. We hope for Singapore to evolve into a cohesive community of people with gentle heart for love and respect of nature. And most importantly, for all Singaporeans to find true happiness. Interview conducted by Sonia Ong. All Copyrights Reserved 3rdOp 2013. Komang Ari Prasetyo is only 20 but he is already on a mission to sell what he calls the best chocolate in Bali - and his claim may well likely be. Chocolate lovers, health nuts, gourmets and connoisseurs will melt on encounter with the universally pleasing combinations in every bar of his 'Chok Chok Chocolate'. His delicious rich, creamy and thick bars of chocolate are 82% cacao, handmade, organic, and come in three selections: Gila Gila (Dark Chocolate with Caramelized Almonds), Chok'lapa (Dark Chocolate, Almonds, & Coconut-Vanilla-Almond Butter), and Wedang (Dark Chocolate, Almonds, & Spiced-Almond Butter), making for a satisfying combination. Komang has been generous in every way in his design and production of this chocolate. 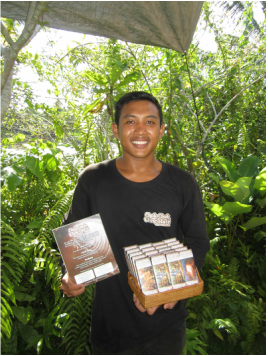 Every part of his chocolate down to the cacao has been made in Bali. What strikes one is his candor and altruistic intent to share as much of his proceeds with the farmers. His exemplary one-third share of sales to farmers is ethical and compassionate. Chok Chok chocolates are guilt-free and uplifting in every way. Each bar is great value at Rp 30,000 and can be found in all fine restaurants and health food stores in Bali, Indonesia.